سطح ماه در طول ساليان درازی که از عمر اين قمر می‌گذرد توسط هزاران سنگ آسماني سرگردان مورد اصابت قرار گرفته و اين بمباران دائمی به ماه چهره‌ای آبله‌گون بخشيده است. از آن‌سو ماه فاقد فعاليتهاي درون سياره‌ای و اتمسفر است، بنابراين همچون فسيلي ‏دست نخورده، اطلاعات باارزش زيادي از گذشته‌های دور در سينه خود حفظ کرده که مطمئناً مطالعه آنها دانش بشريت را در رابطه با تاريخچه‏ شکل‌گيری و تحول زمين افزايش خواهد داد. With binoculars, examine the rugged face of the Moon. It is pocked with thousands of impact craters from interplanetary asteroids and comets. Ever wonder why Earth, a much bigger target, apparently has so few craters? They're so rare that a pristine example, the Barringer Meteor Crater in Arizona, is actually a tourist attraction. Did Earth just get lucky and dodge the heavy artillery?No, throughout the history of the solar system, Earth was bombarded even more than the Moon. But Earth is so geologically active that earthquakes, volcanoes, and plain old weather are continually crushing, melting, and reshaping its crust. In short, Earth is continually destroying evidence of its past, including evidence of ancient impact craters. Almost all the terrestrial craters that have been identified—only some 170 at last count—have been so eroded that essential clues have been erased.Not so the Moon. In fact, according to Paul Spudis, a senior planetary scientist at Johns Hopkins University's Applied Physics Laboratory, one of NASA's best reasons for returning to the Moon is to learn more about Earth. "The Moon is a witness plate for Earth," declares Spudis, borrowing an apt term from weapons research. When scientists want to measure the type, amount, and pattern of damage done by an explosion, they set up diagnostic "witness plates" of various materials nearby to register the impact of shrapnel and radiation. "Earth and the Moon occupy the same position in the solar system," Spudis explains. "While Earth is a very dynamic planet, the Moon is a fossil world with no atmosphere. So the Moon preserves a record of the early history of the solar system that is no longer readable on Earth. "That's not just speculation. In the early 1970s, the astronauts on the last three Apollo missions (15, 16, and 17) returned deep-drill core samples from three different sites on the Moon. The cores drilled more than 2 meters into the lunar regolith (the layer of broken rock and dust covering the Moon). "The deepest samples brought up by those drill cores were 2 billion years old, and largely unchanged since they were laid down," Spudis says. And what a surprise recent re-analysis has revealed. "The lunar regolith traps particles from the solar wind. And drill cores show that the solar wind had a different chemical composition 2 billion years ago than it does today. There's no known explanation for that in solar theory. But that discovery is crucial for understanding the formation of Earth—and also the evolution of stars. "Below: Apollo 16 astronaut Charlie Duke (feet shown) drives a core sample tube into the lunar regolith. [More]Another big question a return to the witness-plate Moon might help answer is, What caused the sudden mass extinctions of life forms on Earth that mark the ends of different geological eras?The most famous is the so-called K-T extinction that wiped out the dinosaurs 65 million years ago, marking the end of the Mesozoic Era (the age of reptiles) and the beginning of the Cenozoic Era (the age of mammals). Much evidence suggests that an asteroid some 10 km wide slammed into Earth, creating such catastrophic climate change that photosynthesizing green plants died, starving more than half of all living beings worldwide; indeed, ground zero has been identified on Mexico's Yucatán Peninsula as the Chicxulub Crater, 160 km across.There's evidence in the fossil record that such impacts occur periodically, "once every 26 million years," says Spudis. "Not everyone agrees, but I think it is pretty convincing. "Why would this happen? "Some theories are wild!" There might be a dark, distant companion of the sun that periodically perturbs comets in the Oort Cloud, and the comets rain down on Earth. Or perhaps the solar system as a whole is moving in and out of the plane of the Milky Way galaxy, and this somehow triggers periodic episodes of bombardment.Before we get carried away with theory, however, "we need to establish whether this really happens," Spudis cautions. Is Earth truly subjected to periodic bombardment? 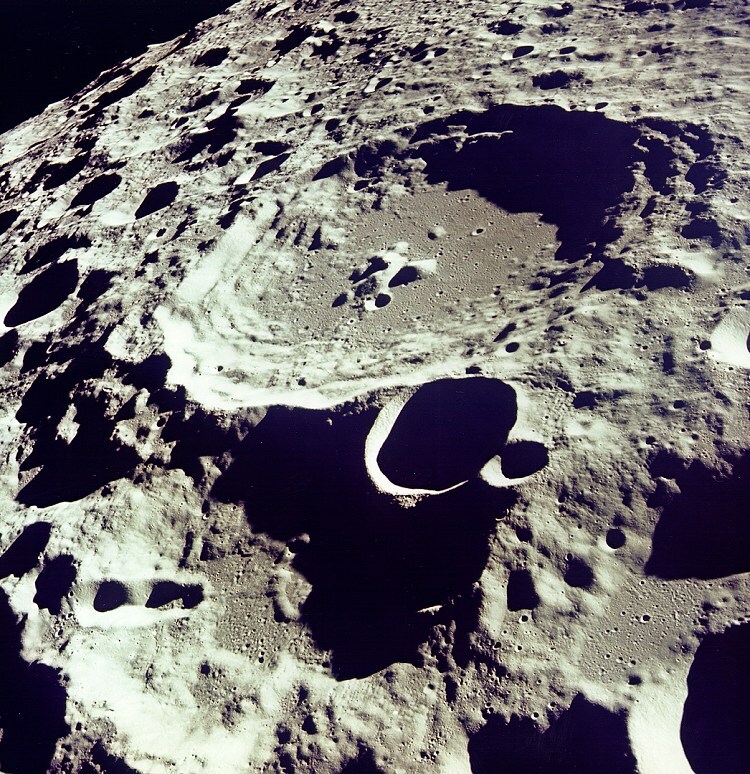 Again, the Moon holds the key: Close-up study of the floors of several hundred lunar craters could confirm or falsify a 26-million year period. "We have to sample the stuff that got melted by the shock of impact, and determine the craters' ages. "The Moon is a harsh—and reliable—witness for Earth.
. منبع: The Moon is a Harsh Witness . حتي اگر با يک دوربين دو چشمي به ماه بنگريد، سطح ناهموار آن را به وضوح مشاهده خواهيد ‏کرد. سطح ماه توسط هزاران حفره و دهانه برخوردي ناشي از برخوردسنگهاي سرگردان آسماني، آبله‌گون ‏شده است. نکته قابل تعمق ديگري نيز وجود دارد!! در اواخر دهه هفتاد ميلادي، فضانوردان سه ماموريت پاياني ‏آپولو (15، 16 و 17) نمونه‌هايي از عمق دو متري سطح ماه که از سه مکان مختلف مأموريتهاي ‏آپولو 15 تا 17 تهيه شده بود را با خود به زمين آوردند. عميقترين نمونه‌اي که به زمين آورده شده ‏بود حدود 2 بيليون سال قدمت داشت و بررسيها نشان داد که مواد مذکور و ساختمان آنها از آن ‏زمان تا کنون تغييري نکرده‌اند.